New tread, as Northern Country into 40c Today and heatwave last until Saturday 26th weak cool change with less rain likely. Another day hotter than forecast here, got to 35C vs 32C forecast. Back down working in 37c heat in the valley!! Reach 40.2c at 5pm and clam no winds. Bendigo slowly ghost town from 12pm to 6pm. This Friday looking is dangerous wind in morning to change about 12pm reach central Victoria. Hopefully cyclone remnants arrive late next week to put out the "issues Vic is about to face". Without rain, there will be many tired folk in Vic (not putting down more-tired farmers out there around Aus) - I'm alluding to fires down this end of Aus. Melbourne's minimum temperature forecast for tonight into Friday of 29 degrees will surely give some records a shake. It's going to be absolutely oppressive trying to sleep in that if you don't have A/C. Easterly keeping temp down in Sale today, max29C forecast. Heard Lily Amb. on radio this morning telling us that despite the temporary emergency diesel generators being removed from Morwell, that the Vic Gov's investment in more renewable generation installed "and contracted to be installed" over the past year, will, according to AEMO, ensure the power stays on. Note the heavy reliance on the interconnectors to deliver power from the other states, we are now totally dependant on 1,000MW of "someone elses" generation to see Vic through on high demand days. 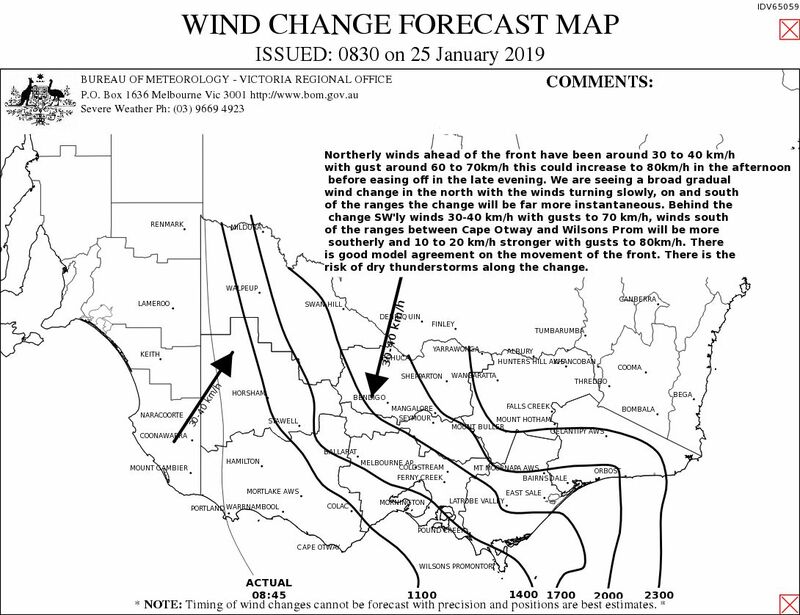 We'd better hope that no bushfire passes below one of these lines, .....or perhaps Lily believes today and tomorrow might be sunnier and windier than what AEMO's models portray? 41°C here now, 3 above forecast, many places in central and western areas have already exceeded forecast temperatures including Melbourne currently on 37.7, Fire Danger Index also above forecast with much of SW currently well above Severe. Melbourne now over 40C. Forecast for tomorrow now 43C. A lot depends on timing of cooler change I guess. Forecast is now up to 44 for Melbourne tomorrow, cool change looks slightly slower. South Western suburbs of Melbourne failing to hit the 40 C mark today, definitely unusual for this side of the bay to lag behind on horrible days like this. Was this purely down to the South Easterly winds sweeping off the bay today? The most trusted site out my way, is the nearby Truganina weather station (Run by a former BOM Meteorologist) it hit a top of 37.8 C but the humidity was up compared to suburbs nudging 40 C.
If Melbourne hits 44 tomorrow is that its highest since Black Saturday?? Unremarkable day out this way, a sunny 32C with seabreeze arriving around lunchtime. ...but the electrical system SA/Vic/NSW has been in chaos for several hours. Market intervention pricing now invoked for all three states, meaning that all available generators, despite being mandated ("directed") to generate at full load, will only be paid the average of the (normal) prices in place this time over the past 2 weeks. Means peaking plants (expensive fuel costs), and hydro schemes ("wasting" water reserves allocated for high price events) - all getting a canning financially, despite saving us from the lack of wind and currently declining solar generation presently underway. If you were say, a hydro electric dam operator, with say, 100 hours of water available to generate to support the electrical system in these typical summer peak periods, only to find you've HAD to let your water go for low electrical price returns (circa $100/MWHr instead of the "advertised" $14,500/MWHr technically now on offer). After this haircut, wouldnt you be motivated to tell AEMO that there is a breakdown happened tonight, and the generator is not available for operation tomorrow (when we will really really need that power) - so save themselves from taking another financial haircut. The system is broken, flooded by unreliable renewable energy "generators", paid by our taxes, only to create blackouts! 38.6 at 415 today, low of 13. Incredible fog around Gisborne just before 7am. And what's the answer? Coal, I presume? If we can capture the emissions, fine. But there's no use fixing a problem with the actual problem. We are having above average, record-breaking summers year after year. This month will be the hottest month in recorded history but it's not surprising given that this is a concurrent trend, one which is wreaking havoc across this nation. Hopefully this ecological disaster of a month ends tomorrow afternoon. 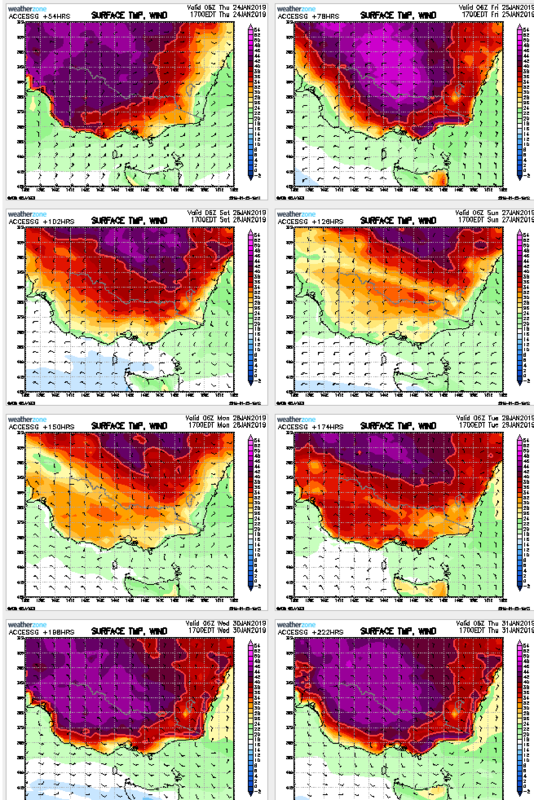 BOM forecasting a top of 44 now, which is in line with what some models have been suggesting for over a week. Sean, the "actual problem" ....that is causing chaos in the SA/Vic/NSW electrical system, is due to too much CO2 in the atmosphere? Any transition must ensure a stable network which can provide reliable power including at peak demand. People from all sides need to understand that Australia has massive demand spikes on hot days, far more than Europe or America meaning there must be massive surplus capacity in the network - something which is far easier with coal and the likes than wind or solar. If the urgency to stop using coal is as much as experts say then we must atleast consider alternatives like nuclear. Emergency situation right now, SA has no battery input (all cashed in for $$ hours before, ...not held in reserve for a full lights off scenario), zero solar input, and only 100MW (way less than 5% of the installed propeller generation we all paid for in our taxes). SA is reliant right now on 430MW of generation from Vic to keep the lights on. BUT Vic, itself, is reliant on 600MW imported from NSW(coal)/Tas(hydro), hence circa 150MW to keep our own lights on, as we pass this power to SA. ....all this with no bushfires under the vital state-state power lines. God help us if fires are added into the (the already basket case) equation for the power system in SE Aus tomorrow. Without any major fires ect happening! So, how hot could it get tomorrow in Vic? In Melbourne? Petros not sure where you have your info from, but our Diesel generators were actually turned on late today to prevent Victoria from suffering massive blackouts. SA are currently supporting VIC not the other way around. in fact sounds like both states are relying a fair bit on Tassie atm. South Australia's fleet of diesel generators were fired up for the first time, amid tight power supplies here and in Victoria. The State Government was directed by the Australian Energy Market Operator to make the move about 5.30pm, on the grounds that the generators were required to prop up Victoria. At the time, SA was meeting its own energy demand of 2985M from local supplies including wind and gas power and exporting a small amount into Victoria. Victoria had a significant shortfall from local generation, and was calling on significant supplies from Tasmania and NSW. Teckert, my post #....23 was fully correct at the time posted. My data from NEOMobile, but is verifiable (and comes from) AEMO. Look at AEMO website to verify. I did hear your emergency generators were dispatched this arvo, ....to "save Victoria", that message emanated from ABC news ("cant let a renewables story go bad"). Lets wait for the inevitable AEMO report in months to come to see why the direction was made, .....(because tomorrows turmoil will create the Armageddon of report overload). SA generators "saving us or not" .....the lights went out in Vic this evening due to AEMO directed load shedding request to Ausnet. yep you will struggle tomorrow, hopefully with it being cooler here the demand wont be as bad, and I'm aware of the load shedding issues. Thankfully we dont have those issues here anymore. My point was correcting the bit about VIC supporting SA - which wasn't correct. You have "those issues" there in SA worse than Vic Teckert, you will get a couple of repeat doses of the power issues you experienced before last years mild summer (in electrical load terms). A fire under the SA interconnector on a very hot day and your black. Get to March, then breathe a sigh of relief imo. ....and at the time of my post #..20, I WAS correct, Vic was sending power to SA as I posted. Go check Teckert. 45C for Sale tomorrow P, might have to turn on the A/C for one of its rare runs. Australia cope how run power management from all states and this is really good test. Heatwave for population using Solar Panels. I think its not doing anything becasue A/C use more power sucking as no power return to the grid. Will be into it at 7am Samboz, thanks for the heads up. Heyfield copped a share of this evenings electrical load shedding, so freeze some ice etc. for tomorrow, might be our turn for power off! Victoria very good using Brown coal , Hydro and Gas. I'd advise you to get your electricity data from the AEMO website CA. Agree, 7AM is the way to go ! Have a solar powered 73L refrig/freezer in ute P, very handy with 100W panel on canopy roof. Could leave and forget for a month++ and it would be fine (particularly in summer light conditions). Good advice, must admit I rely more on the reliability of electrical supply (which was the major role I did when employed in the electrical system), need to get my head around this "new electrical supply reliability world". Petros, If you can link to the particular evidence I'll be grateful. tbh I dont think you quite a have a correct understanding of both what has happened today or what the situation is here in SA now. NSW and VIC have so much more problems than SA now in terms of power. I apologise for setting foot in the VIC thread but i saw a comment that was incorrect so thought I should at least try and make it known. I'll head back to SA now. Send me your concerns via PM, Teckert. If you have the patience, I'll provide any evidence you request. But dont insult me with lack of understanding of the electrical system please. Vic shed smelter pot lines, not exactly as dire as you make out. They are expected to go out at times of extreme load. Outages were mostly local distribution failures, not lack of generation. I was watching the scada on the vic transmission network through the afternoon. Power flows between states are a common occurrence, not “chaos” or an emergency. System and market worked as intended and designed. Stormcast charts forecast for thunderstorms tomorrow. Today was great, hit 40c here spent hours at the beach and did a solid 10k walk light to mod E SE winds not a cloud LOVING this heat. Watch the murray espec Mildura but maybe more so Swan hill all time records could fall there and SW NSw could get 50c sliight chance if no cloud and not to windy Pooncarie ivanhoe those kinda places. 32.6 degrees when I got up at 530 this morning just felt like pure insanity. 37.4 at Morrabin airport close to where I am. Strong northerly outside. Touche! Bit of a necessity unfortunately! Latest Wind Change chart with updated timings. Lovely and cool around 22 here in Portland behind it - sorry guys but at least you know its coming! Agree with the contracted loads. But you are wrong, Victoria experienced involuntary load shedding for 2 1/4 hours yesterday. 19C minimum here overnight, but with the arrival of the odd puff of northerly, is now 41C. BOM has upped our expected max to 45C today I see. 38C at Bairnsdale Airport. Odd puff, like you Petros, of nthly. AEMO have advised that without a generator somewhere making an unavailable generator available again, then commencing at 2:30pm, up to 360MW of load will have to be turned off in Vic, similar to last evening, just a lot more folk with power off. ....and if they follow the same pattern as they did last evening, it will be again, the country folk (the ones less likely to write into the papers) who have to sit the afternoon out with no power. - AEMO Emergency Reserve Trader has again directed a generator to commence generation despite being marked unavailable. My bet is that it is again, the SA emergency generators as per yesterday, only much earlier. This means the wholesale price of electricity in SA/Vic will revert to the lower values (potentially making revenue far less than operating cost for many generating plants) that they were at this time past 2 weeks. No peaking plant generator will want to again, loose money for the honor of supporting a failing electrical system for the second day in a row. NNW'ly well and truly arrived here, currently 42.7C 18%RH. Got 32km's in with 0715 start P, went for a 1.5km walk around 11am, temp sky rocketed over 3C in that 20 minutes. BOM East Sale - "42.4C @ 11:18 am" and "42.7C @ 11.23 am"
Interesting discussion P re power suppliers being bent over the barrel, while I have no idea of the overall profitabilty of generating elec. for us masses, I know I will be mightily P'd off if my power goes off because of some bean counter playing god with his calculator!! Very funny Samboz "bean counter playing god with his calculator!!" I think power controller pick isolated small town turn off power. How does NBN FTTN green cabinet handle high heat could outrage internet...Never heard of it yet. Spare a thought for those poor folk now without power in Victoria, 100MW of customer load (real folk out of power, not including those "meant to shed load" during hot days) now sitting it out. Very windy and 43.1C 15% RH here atm. - note that AEMO dont use daylight saving time, so the 11:03am = 12:03pm DLST. Very nice Adelaide is 24.4°C now..will not be long for SW Victoria to Melbourne next few hours. Last night was the worst night ever. Was 31 deg inside, A/C not working and the fan just recirculating the hot air. Need this cool change to arrive because my house is like an oven atm!! Haven't used A/C, just a small fan so far, opened house up early and it's still OK inside. Meanwhile we might(?) have peaked, BOM at East Sale- "44.2 @ 12:50 pm"
Nice to know Geelong has the change. shocker today. PyroCumulus reported to be about 38,000ft. Currently 43.3 outside and 35 inside, probably a few deg warmer in my room with all the electronics surrounding me. Can see the cool change slowly creeping towards my area, estimate maybe another hour until it reaches here. A bit of heat left for East Sale BOM - "Highest 45 °C @ 1:47 pm"
Yarram warm - "Highest 45.7 °C @ 1:44 pm"
Got a call from a friend in Craigieburn apparently power went out there not long ago and not far from here. Still got power at my house but lost internet connection. Wonder if that's linked. 45.4C here, windy, 13% RH. That's because another electricity distributor (powercor/CitiPower) and several other distributors cover the rest of Victoria, not just Ausnet. Change now through the Melbourne CBD - 27.8 at 2:20pm at Olympic Park. Good point Forrester - didnt think of that. Soon power management back normal for Melbourne is 27.4°C falling. Power restoration commencing right now. 41.1 here for a high, 39.4 here atm sun been in for quite awhile. Swan Hill 47.5c . Looks like a Victoria state record for January. Interestingly other places in the Mallee didn't even get close. Here comes the lightning out east of Melbourne!! Probably a bit far west. Kerang's come in with 47.0 at 3pm but haven't seen a max yet. Wouldn't surprise me if they went even higher. Kerang max (to 3pm) of 47.4. Might have warmed up further later but we won't know until tomorrow. I read somewhere that Boort recorded a 48.2c during the Black Friday event in Jan 1939. Doesn't pop up in Records as the data hasn't been digitized yet. Lightning tracker showing heaps of lightning strikes on the butchers ridge fires. Hope it settles down. Would probably cause a lot of spot fires. You're correct Sidney ... not good at all. 45C atm at Bairnsdale AWS. Maximum, I think, was 45.2C. Moderate NWly. Huge cloud from Buchan fire to the NE. Never felt 45c in my life. Now Victorians think 30s not hot any more. Would be interesting to see the plume directions as the southerly pushes through. Thanks Sidney. Must be close to record. Change going through here atm. We had a 45 second dusty gusty change pass through here around 5.45pm. No storms or rain. Now circa 31C with light SW'ly, interestingly a weak storm (had two rumbles just now) is trying to establish itself as it passes over. Commiserations to those who got load shed today, but overall (especially fire-wise) - I reckon Vic got out of this "one day heat event" not too badly. But will the past 2 days of load shedding convince enough doubters that the investment put into Aus electrical system over the past 7 years has been effective? .....after all we are all told ad nauseum that the climate is going to get hotter. Was our money well spent? Fired up bbq, calm with thunder rumbles about. Nice. 7mm of very handy rain out of the narrow storm belt. Heap of rumbles to our S/East & East. Cooling of nicely to current 22.6C after Max wind gust 61kph earlier during the breezy day. Ended up with 6mm from last evenings storm. Very lucky. One late one from yesterday: 47.6 at Kerang (all-time site record, Victorian record for January). Looks like trough rain next week downgrade unless isolated thundery cells. 33c at 12.45pm Sunny no clouds. 33.1 for a high today DP this arvo down as low as 1 to 2 degrees. 45.5 degrees for Red Cliffs yesterday. 37.2 degrees today. So officially(Kyabram) had a maximum of 47.1 yesterday yet when I look at the AWS 30 min data the highest reported temperature was at 6.30 pm and was 45.4. So why is the reported temperature so different to what I can see on the AWS data? I thought where a peak is reached, no matter where in the reporting time it gets reported. i.e. if it was 45.4 at 6.30 and then peaked at 47.1 at say 6.38 then this would have been recorded in the data table but there is no 47.1 reported in this table. We normally have or have close to, 40 degrees at 11am, in the morning. Today it's only 19 degrees. Wonderful break Today only 24c and easy sleep temp drop to 19c last midnight. A balmy 21.3C in Sale....very nice! 2.5mm in the earlier hours this A.M.
We got 4.5mm overnight. Cloudy most of day. Currently 25C 58%RH Light smoke haze. We got 1.75mm from a weak storm in the early hours of the morning here too, ...boosted by a couple of pre-dawn showers. whole sum of 0 here in Portland, although we did ave a few 2 second showers. 1.2mm for the month so far and without much chance of more here in the SW looks like it will be our driest Jan on record. Shes warming up again. 37 on wednesday! Generated in 0.059 seconds in which 0.004 seconds were spent on a total of 13 queries. Zlib compression disabled.